The park management of the Puerto Princesa Underground River (PPUR) and the city government here opened again the “jungle trail” that may be used as alternative route to the world-famous site at Sitio Sabang, Barangay Cabayugan, Puerto Princesa, Palawan. 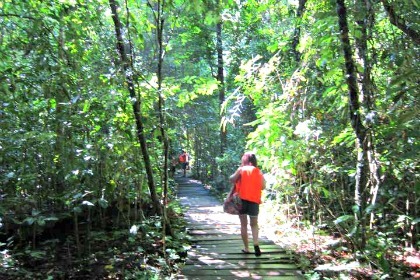 The jungle trail, or sometimes “jungle trek” to the subterranean river, is a 3.56-kilometer somewhat craggy footpath from Sabang to the mouth of the New 7 Wonders of Nature river. Mayor Lucilo Bayron said the trail, which was opened again to the public on July 26, can give those who are physically fit and who love outdoor adventures an option to continue to the underground river even when the wind at sea is burly and boat trips are cancelled by coast guard authorities. “This is an additional route so, that our tourists and guests can still go to the underground river whenever boat trips are cancelled due to strong winds and waves,” he added. Anyone who is still fit to walk long trails, the mayor said, can take 1-2 hours to reach the subterranean river. “The view that they can see by using this jungle trail to go to the underground river is fantastic, and there are small caves they can see along the way. If they’re not constrained by time, they can do the jungle trail and be entertained by the purity of the environment and the scenic view,” Bayron said. He added that patronization of the alternative route will also provide jobs to around 20 Tagbanua indigenous community members because they will serve as guides under the Community-Based Sustainable Tourism (CBST). They will be called park wardens. The indigenous peoples (IPs), according to park superintendent Elizabeth Maclang, will be left in charge of taking care of the jungle trail under the CBST. This means giving them the right to co-manage the site to also earn income for their families. More than anybody, she said, they are the ones “very familiar” about the jungle trail. Maclang said it took four months to rehabilitate the trail that was closed a few years ago to visitors due to dilapidated facilities that would not make the trek comfortable. “The best thing about this is that we can provide work to the IPs, and we can show case what really is the environment in the park, what is its outstanding universal value,” she said. Thankful for the successful opening, Maclang said the jungle trail is one of the best things about the park now as it will also ease human traffic at the Sabang Wharf since visitors would have another option to go to the subterranean river. The trek will start at the area where the Mangrove Paddle Boat Tour is located in Sabang, according to her.